Rutina Wesley and the cast of "A Raisin In The Sun" radiate! Last night, I attended the premiere of the radio recording at the LA Theater Works of the Pulitzer Prize-winning classic, "A Raisin In The Sun". The play was written by Lorraine Hansberry and, in this production, has a great cast including True Blood's Rutina Wesley. The first run of the play opened on Broadway on March 11, 1959 and ran for nearly two years before the stage version was transferred to film with the same cast starring Sidney Portier in 1961. A Raisin in the Sun portrays a few weeks in the life of the Youngers, an African-American family living in the South Side of Chicago in the setting of sometime between WWII and the 1950s. The matriarch of the family, Mama, wants to buy a new house to fulfill a dream she shared with her husband. Mama’s son, Walter Lee, would rather use the money to invest in a liquor store with his friends. He believes that the investment will solve the family’s financial problems forever. Walter’s wife, Ruth, agrees with Mama, however, and hopes that she and Walter can provide more space and opportunity for their son, Travis. Finally, Beneatha, Walter’s sister and Mama’s daughter, wants to use the money for her medical school tuition. She also wishes that her family members were not so interested in joining the white world. Beneatha instead tries to find her identity by looking back to the past and to Africa. source: Wikipedia. 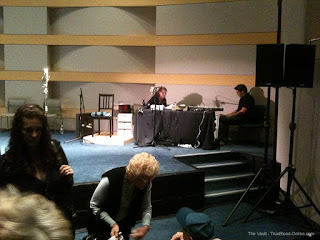 It was fascinating to see a play performed specifically for radio. These types of performances are recorded without sets or costumes, and therefore rely on the actors to amplify their performances through their voices. The play was about two hours long and did include sound effects that also aided in creating the illusion for the listener. The cast sat in chairs at the back of the stage and each rose and slowly moved to one of the microphones when it was their turn to speak their character's lines. They all did a superb job in portraying this family's very moving story. Each actor not only read the character's lines, but also provided their own animated style giving added life to the production. While watching the actors perform, and with the addition of the external sound effects, you could see in your mind's eye the family's small apartment and almost smell the breakfast cooking. The sound effects, which added much to help build the illusion of the setting, were done by Rachel Yamshon and Kevin Pong who were also on the stage in full few of the audience (see photo below). The recording engineer and editor was Mark Holden. Although no photos were permitted during the performance, Rutina looked lovely in black leggings, a light blue top and red flats. 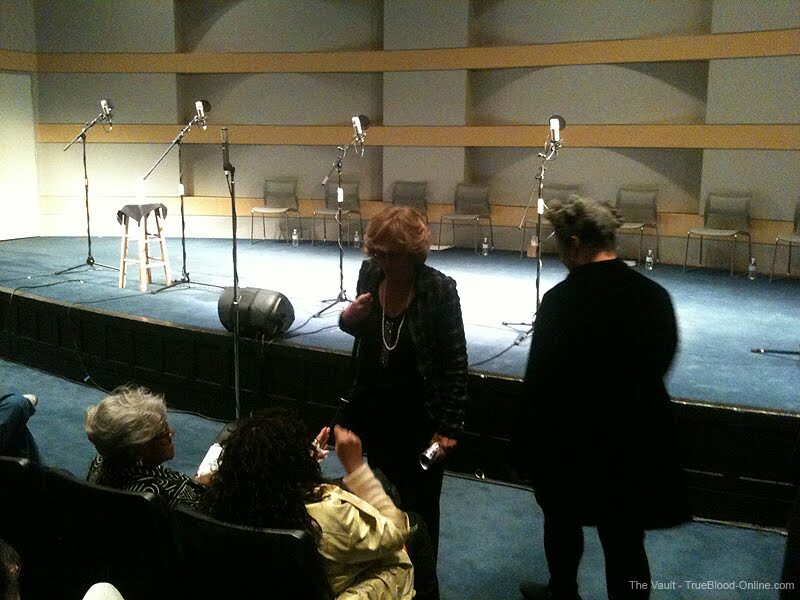 The photos below, taken during the intermission, show the stage area with microphones and chairs where the actors sat. The sound effects area that was located to the right of the stage. Having seen the film version of the play, I knew I would enjoy watching it again; however I was just blown away by the acting of this exemplary cast. Rutina and all of the cast performed their parts to perfection and I strongly encourage anyone to see this production while you can. 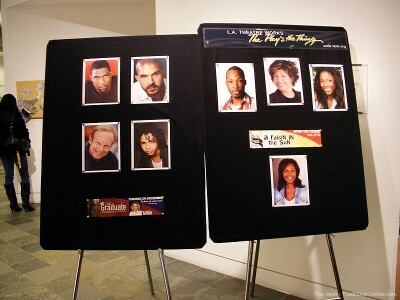 The play will be performed five times, November 17-21, at the Skirball Cultural Center. And, if you don't get a chance to attend one of the remaining performances, the L.A. Theatre Works' nationally syndicated radio theater series airs locally in Southern California on KPCC 89.3 every Saturday from 10 pm - midnight. The audio show also airs on many other radio stations throughout the country and can be streamed on demand at www.latw.org. Thanks to Chelsea for the additional photos. 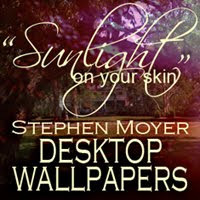 Article by Lynn Powell Dougherty featured at trueblood-online.com. 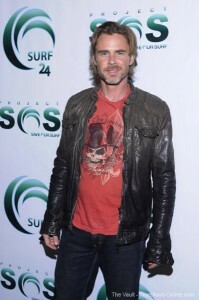 Saturday night in West Hollywood, the surf was up!I attended a charity gala event for Project Save our Surf, called "Actors for Oceans" at the Falcon Restaurant on Sunset Boulevard. The event's purpose was to raise awareness and gather contributions toward keeping our oceans clean and to support the organization. Project Save our Surf, founded three years ago by Tanna Frederick and surf legends Shaun Tomson and PT Townend, is a 501c3 non-profit organization which raises money toward cleaning up our oceans, helping Surfrider, Heal the Bay, Inside the Outdoors, Oceana, and many more ocean orientated organizations. 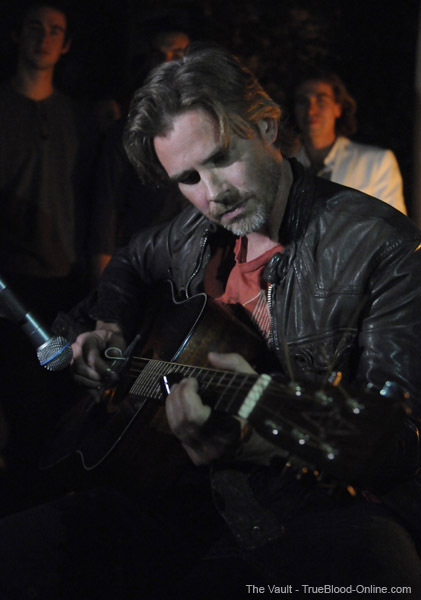 In addition to Sam Trammell, there were many celebrities attending the event including True Blood's Michelle Forbes, Natasha Alam and Michael McMillian. Also attending were actresses, Tanna Frederick (the founder of the S.O.S.) and Tia Carrere.Scheduled to perform their musical talents was actress, Tia Carrere and True Blood's Sam Trammell. After a short stint on the red carpet, Sam walked to the restaurant. Before he entered, I met him and asked him if he would agree to a short video interview with me. As Sam is always extremely gracious, he said, "Sure".Once inside we spoke for a few minutes as he posed for photographs with lots of attendees. Originally, he wanted to do the interview right away, but after a few minutes inside, we both realized that it was just too noisy and crazy then, so we decided to wait until after he performed.Before Sam performed he mingled with the crowd and again was extremely friendly and gracious.Sam and Tia Carrere were scheduled to perform and Tia was first on the program. she sang two songs for the Mauli Ola Foundation. 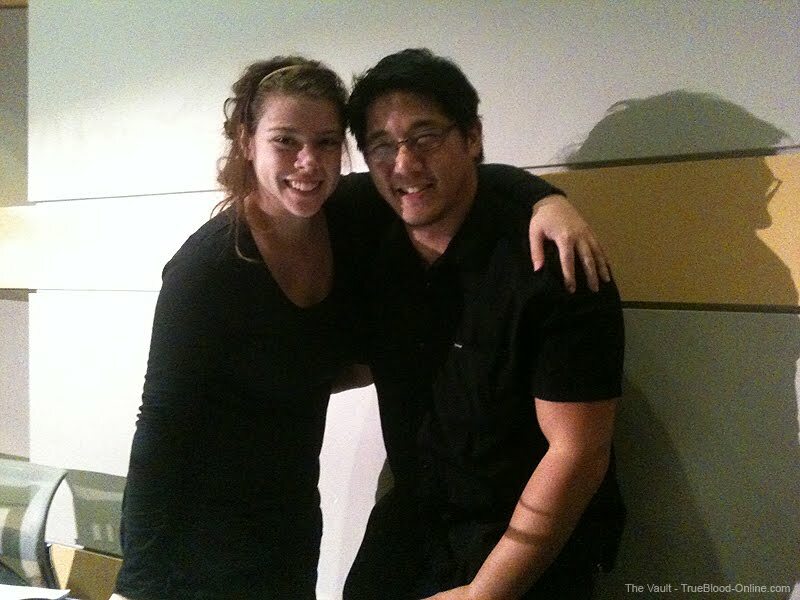 She was accompanied by Daniel Ho on guitar. The Mauli Ola Foundation and their program, "Surf Experience Days", pairs professional surf instructors and novice surf students who have Cystic Fibrosis to introduce them to the healing properties of exercise, ocean air, achievement, and fun in a supportive environment. Hypertonic saline (which is prevalent in the ocean air just above the water’s surface) has been shown to be a natural treatment for people with Cystic Fibrosis. Then, after a brief five minute break, it was Sam's turn to perform. I thought he did really well even with the poor sound quality which was not the best. There was no stage and lots of things going while he was playing, including the silent auction. As you will hear in the video interview below, Sam told me that he couldn't hear what he was playing, so he had no idea how it sounded. He was quite good and I think he has musical talent and would have excelled if he had pursued it as a profession. 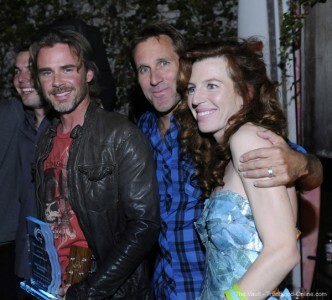 It was very brave of him to play for us and I applaud his effort.After Sam's performance, Tanna Frederick gave Sam an award and told the crowd that Sam had agreed to be on the Board of S.O.S. They both discussed the repeat of the successful 24 hour surfing event which is in the planning to be held again next year. Then, everyone mingled while Sam and the event organizers posed for several photos. Sam bid on an item in the silent auction and won. It was a fabulous surfing photo that he shows off in our video interview below.Once Sam was free, he and I went out to the now abandoned red carpet area which had plenty of light and was not as noisy as inside the restaurant (although still pretty loud) to do the interview. In addition to discussing the photo, during the interview, Sam talks about attending Eyecon 2010 last week and meeting several Billsbabes there including our very own Michael, aka, SterlingSilverCharm. He also discusses True Blood, how he got involved in the S.O.S., and how he hasn't played guitar since he was a kid. Once again, I continue to be amazed by the congeniality of all of the True Blood cast I have met and Sam is way up there in my esteem for his sincere generosity and friendliness. Nothing seems to phase him when it comes to his fans, he is accepting of them all with not a critical word to anyone.Thanks Sam! Many additional photos can be found in the Vault Photo Gallery.